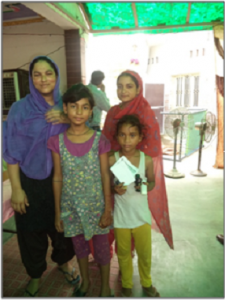 In a recent health camp conducted by The Ponty Chadha Foundation in Usmangari village in Ghaziabad, Salma Bano, was diagnosed and treated effectively by our highly experienced doctors. The middle-aged woman belonging to a joint family had been suffering from acute joint pain since long. Being a mother of two, Salma had to undergo a lot of physical challenges for shouldering her responsibilities for her family. Despite consultation with local doctors, Salma received no relief. It was the ointment and medicines offered by the Foundation that brought a great relief to the rural lady. Post one week of medical treatment provided at the health camp, Salma has now recovered to quite an extent and is anxiously waiting for the next health camp in her village!